The Project Kaltbrunnen school is part of the book Bauten für die Bildung, published by the Schwabe Verlag. The Projects Primary school Erlenmatt and Apartments in Gellertpark by Luca Selva Architects were awarded the Auszeichnung Guter Bauten 2018 in Basel. Impressions of the guided tour on the occasion of the book launch on october 25th, 2018. The projects Residential building Widmi-Park in Lenzburg and Residential building Wuhrmatt, Bottmingen are awarded with the "Best Architects 19" award. Construction for the new residential building at Meret Oppenheim-Strasse in Basel has begun. Construction of the 22 Apartments on a celled groundplan for Artemis Immobilien AG, in Aarburg, has begun. New Pictures of the Housing Development Site Widmi 2 in Lenzburg are online now. The department for Diagnostics Information Solutions DIS receives a new workplace in Basel. The Luca Selva Architects thank all of you for the good cooperation and wish you Merry Christmas and a Happy New Year! Luca Selva Architects won the ‘Silver Rabbit’ at the Award Ceremony of the ‘Best 2017’ for their Design of the primary school Erlenmatt, Basel. Luca Selva is going to speak on the occasion of the lecture series ‘here & there’ of the Faculty of Architecture of the University of Munich. The theme of his speech will be ‘matchball’ and it will take place on November 23rd 2017 in the hall of the Faculty of Architecture. Luca Selva is following an invitation from the city of Cologne and speak about ‘perspectives in cologne of living and working’. The event will take place on November 20th 2017 at 7.30pm in the lecture hall of the Museum am Neumarkt. The glass mosaic façade of Roche’s Building 41 becomes visible. Luca Selva, David Gschwind and Likas Schirmann speak about Luca Selva Architects' recently won competition at Bernstrasse, Luzern in ABL-Magazin's most recent issue. Luca Selva about the house on Steinentorweg built by Diener & Diener Architects. With their design for Linth-Escher, Luca Selva Architects are part of the publication ‘Zurich Housing Development 1995-2015’, published by Quart-Verlag. 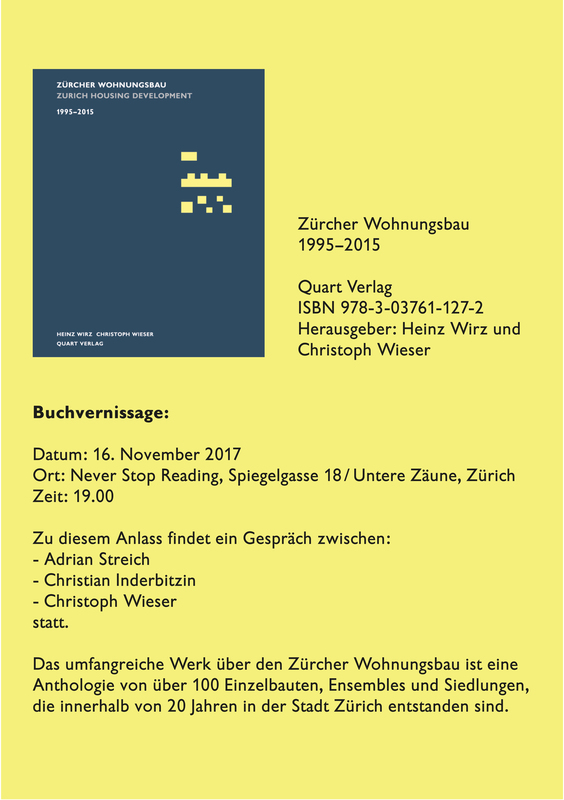 The book launch will take place at the bookstore ‘Never Stop Reading’ (Spiegelgasse 18 | untere Zäune, Zurich) on November 16th 2017 at 7pm. Luca Selva Architects get nominated for the ‘Best 2017’ with their design of the primary school Erlenmatt, Basel. The presentation and Award Ceremony will take place on December 5th 2017 at Toni-Areal in Zurich. The design of Luca Selva Architects wins the project competition of 150 apartments at Bernstrasse in Luzern, issued by the Allgemeine Baugenossenschaft Luzern (ABL) and the Baugenossenschaft Matt. Luca Selva is going to speak about questions in residential construction at the lecture ‘typologies spécifiques’ of the Department of Architecture at the School of Engineering and Architecture of Fribourg. The Roofing Ceremony of Roche’s Building 41 took place on Thursday, April 20th 2017 in the presence of clients, builders and planners. The Sea Lion made out of bronze by artist Urs Cavelti takes its place. Citygate entered the shortlist of the architectural competition Beton 17. The design of Luca Selva Architects for the Swiss TPH of the tropical and public health institute, has been awarded 4th place. The design of Luca Selva Architects for the housing development competition on Burgfelderstrasse, issued by the Bau- und Verwaltungsgenossenschaft WOHNSTADT, has been awarded 2nd place. The topping out ceremony for the Erlenmatt primary school took place on October 27th and was attended by the contractors and the planners. The projects 'Primarschule Erlenmatt' and 'Kaltbrunnen Schulhaus' are part of the current exhibition 'Schulhausbauten in Basel von 1945-2015' at the Swiss Architecture Museum. The current edition of 'TEC21' magazine mentions our project 'Linth-Escher' in Zürich-Oerlikon. 'Werk-material' the current edition of 'werk, bauen + wohnen' presents our project 'Gellertpark'. The 'SIA-Tage der zeitgenössischen Architektur und Ingenieurbaukunst' are about to begin. Our projects 'Wuhrmatt' (Saturday, Mai 21, 2016) and 'Gellertpark' (Saturday, Mai 28, 2016) will be part of the exhibition. The 35th edition of the BDA 'Wechselgespräch' - event at the Stuttgart based gallery 'Wechselraum' invites Luca Selva and Meinrad Morger with Anreas Denk to discuss the topic 'Schönheit: Pflicht oder Kür?'. The debate is presented by Daniel Kurz. The construction works for 140 appartments in Lenzburg have started. The current issue of the 'TRACÉS' architecture magazine is dedicated to projects in Basel. It presents some of the latest projects by Luca Selva. Our project 'Wohnhaus am Gellertpark' is displayed in the latest issue of 'best architects 16'. Start of construction works at Roche, Basel. The alternation of 'Roche Bau 41' has started. Hubertus Adam and Luca Selva are guests in a gallery talk about the current exhibition entitled Eight Windows featuring Luca Selva Architekten’s work. On Thursday, October 29, 2015, Luca Selva Architekten had a successful opening of their exhibition entitled Eight Windows. The guests included Regula Lüscher, Director, Berlin Senate, Department for Urban Development and the Environment. The exhibition at the Architektur Galerie Berlin continues until December 12, 2015. The Zentrum für Frühförderung ZFF [Center for Early Intervention] and the Zentrale Behörde für Adoption und Pflegefamilien [Central Administration Office for Adoption and Foster Care] now have a barrier-free access, which was designed by Luca Selva Architekten, available at De Wette-Strasse 3 in Basel. Luca Selva Architekten’s residential project in Gellertpark has been nominated for the Arc-Award 2015. The model will be presented at the Werkschau Architektur 0.15 in the Maag Halle, Zurich. The exhibition can be visited from Saturday, October 31 to Tuesday, November 2, 2015. An exhibition of the work of Luca Selva Architekten at the Architektur Galerie Berlin. Presented under the title Acht Fenster [Eight Windows], through five large-format photographs at a scale of 1: 1, Luca Selva Architekten focuses on the Multigenerational Home in Binningen. On Saturday, September 12, 2015, Luca Selva and Roger Braccini will give a tour, as part of the European Heritage Day in Basel, with interesting insights into the Densa residential project featuring 99 new apartments on a former industrial site. The residential project Trigenius on Wuhrmattstrasse in Bottmingen has been completed, and the new 58 apartments are ready to be occupied. The new building on Gellertstrasse has been completed and handed over to the client. In the meantime, all eight apartments in Gellertpark are occupied. The cornerstone for the Erlenmatt primary school has been laid. The progress of the construction can be followed live via webcam. The project Apartments in Gellertpark has been awarded the label of best architects 16. The projects of Kaltbrunnen-Schulhaus, Youth Campus Basel and the residential development of Densa-Areal have been published in the new and extended edition of the Architectural Guide to Basel. This guide documents the building history of the city and its surroundings. Further projects by Luca Selva are also mentioned. In the competition for the new building for the Sports and Health Department of the University of Basel the design by Luca Selva architects was awarded 5th place. The project for the elementary school Erlenmatt that won 1st prize in the competition dating December 2012 has begun construction. The building of the new school, with a triple gymnasium, a kindergarten and a daycare facility can be followed by the onsite webcam and will be completed by June 2017. The projects of City Gate building D, the multi-generational home and the Youth Campus Basel are published in the edition of Best Architects 15. After topping the structures of the three residential buildings in Bottmingen the developers have celebrated the event with the craftsmen and planning staff. 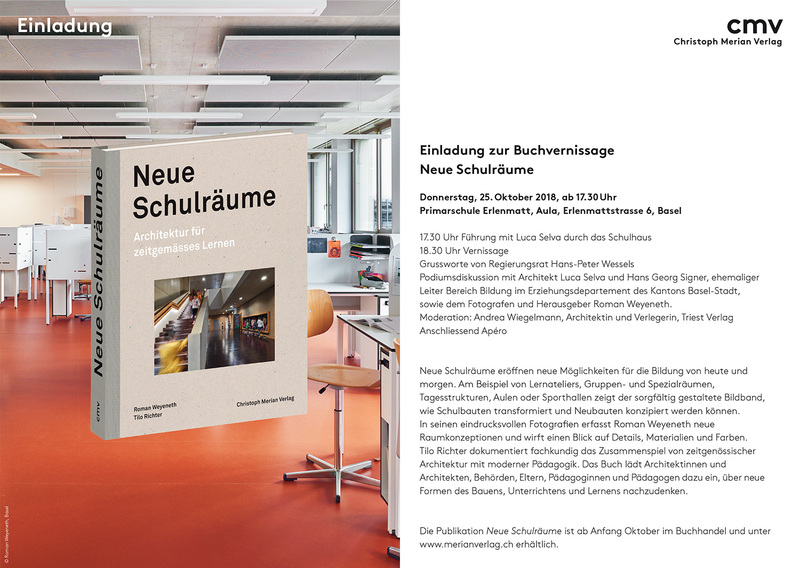 On October 16th 2014 at 6.00pm those interested are cordially invited to join us at the vernissage for the new book titled Eight Homes and a Pavillion at Galerie Stampa, Spalenberg 2, Basel. The residential building in Gellert Park will be completed in spring 2015. After topping the structure the owners have celebrated the event with the craftsmen and planning staff. The House H in Riehen is based on a spiralling space continuum. It was completed and occupied by the owners in July. The new monography about selected houses by Luca Selva Architects will by published on time for the Frankfurt Book Fair at the beginning of October. It is published by the well-respected Park Books publishing company and edited by Christoph Wieser. The 21 apartments of the second stage of the development for the Linth-Escher cooperative building association was occupied by happy tenants on August 1st. The residential development Densa-Areal and the multi-generational home are two of the 21 projects that will be added to the newest edition of the Architectural Guide of Basel. The projects of City Gate building D, the multi-generational home and Youth Campus Basel have been awarded the label of best architects 15. The preview of the replacement buildings for the Linth-Escher cooperative building association at Bülacherstrasse 2 + 4, 8057 Zurich Oerlikon is on June 28th from 1.00pm to 4.00pm. 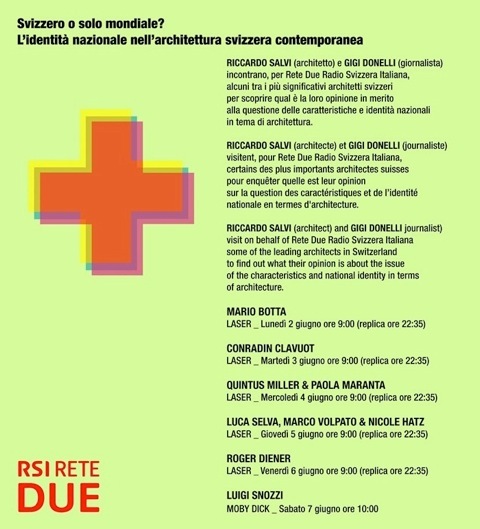 Luca Selva Architects will participate in the exposition of the Biennale 2014 in Venice. Their contribution „Specific Typologies“ delves into the questions of residential development. The exposition in Palazzo Bembo opens on June 5th and runs until November 23rd 2014. The Intercity House has been completed and handed over to the owners. The project for the housing estate on the grounds of the former cotton factory in Cologne is presented at the Citizen’s Fair in Cologne-Holweide. As part of the 'SIA-Tage der zeitgenössischen Architektur und Ingenieurbaukunst' the buildings City Gate House D and the Youth Campus FC Basel will be open to the public. The design of Luca Selva Architects for the competition Maiengasse in Basel is awarded 3rd place. City Gate House D could be handed over to the owner. First residents are moving in. The single family house on Nonnengärtli in Binningen has been completed and occupied by the owners. Among our projects, 'Densa-Areal' and 'House at the Park' have been honored with this cantonal award. The design of Luca Selva Architects for the competition by F. Hoffmann-La Roche on Eisenbahnweg has been awarded 2nd place. After topping the structure of the 2nd stage of the housing development in Oerlikon the owners have celebrated the event with the craftsmen and the planning staff. Construction of the residential development Wuhrmatt in Bottmingen has begun. The works on the conversion and addition of an elevator to the Clara School building have been completed. The opening of the Youth Campus is about to take place. The works on the conversion of an apartment on Hutgasse by Marktplatz in Basel have been completed. Luca Selva Architekten win the project competition '132 apartments' in Lenzburg. The design of Luca Selva Architects for the competition St. Jakobshalle has been awarded 3rd place. Construction of a single family residence in Riehen has started. The works on the addition of an elevator in the office building on Spiegelgasse in Basel have been completed. Construction of a residential house in Gellert has started. The multi-generational home in Binningen has been completed and occupied by the owners. Luca Selva Architekten win the project competition for the primary school. In collaboration with pool architects and aquarium planner International Concept Management Luca Selva Architects win the 5th prize. The 15 inputs of the international project competition are shown at the Messehalle 3 in Basel until the 16th of December. The topping out ceremony has been celebrated. Construction of the 2nd stage of the residential development in Oerlikon has started. The design by Luca Selva Architects for the competition Sandgrube School building has been awarded 2nd place. Ground-breaking ceremony has taken place. Vernissage of the book 'De aedibus 45' by Luca Selva Architekten takes place at Stampa gallery on 10th of May at 6 p.m.
As part of the "15n" the buildings 072_Densa-Areal Basel, 076_Hofbebauung Hegenheimerstrasse Basel and 077_Ersatzneubauten Oerlikon Zürich will be open to the public. The renovation has been finished. The House at Hill Wartenberg is honoured with the 'architecture prize 2011' by the Gemeinde Muttenz. First residents will soon be moving into apartments of House L.
Topping out ceremony for the first stage of building. to build the 'Youth Campus FC Basel'. 1st prize for the work study. The Residence in Lupsingen is honoured with the award 'best architects 11'.